Facebook is to take its first steps into the world of healthcare by creating health tracking platforms, support groups and medical apps. The social networking giant is to follow in the footsteps of fellow Silicon Valley companies Google and Apple, exploring plans to devise ‘support communities’ which will connect people suffering from the same chronic illnesses, as well as ‘preventative care’ applications to improve lifestyle choices. Sources, who have asked to remain anonymous due to the early phase of the developments, told Reuters that Facebook has been meeting with medical experts in recent months, and is gathering ideas to launch and test new health apps. The company noted that users of Facebook already see the site as a way of discussing ailments with other sufferers and seeking advice, therefore the creation of ‘official’ platforms would aid this process. Of course, all this means that Facebook could soon know the status of your health along with everything else – which is why the company plans to release any applications ‘quietly’ and curb privacy concerns by using a different moniker. Discreetness is probably a step in the right direction for Facebook, which has come under fire in recent months for its controversial psychological experiments on users and for demanding that users use their real name in their online profiles, causing outrage among members of the transgender community. 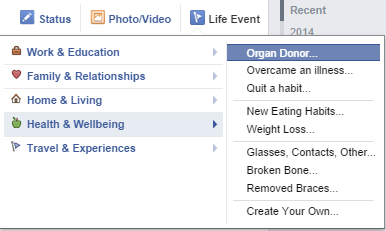 Facebook has had previous success relating to healthcare, most notably in May 2012 when it introduced an option to add ‘organ donor status’ to your timeline. According to a study by the American Journal of Transplantation, on the first day of this initiative, 13,054 people registered to be organ donors in the USA – 21 times the daily average of 616. Additionally, while the phenomenons of this year’s no makeup selfie and the ice bucket challenge arguably emerged independently, they were mostly spread via Facebook and thus owe much of their phenomenal success in raising money for charity to the social network. Main image via Maria Elena at Flickrcc.